Can I say something about the bubbles, too? Early on in development, when you were in a bubble, you just floated around the screen, and when a player hit you, you rejoined the game. Then along the way we changed it so a player in a bubble could shake the Wii Remote up and down to get close to other players. When you need help, you express it in a visible way. Right. As you shake the Wii Remote with both hands, that action of shaking melds with your desire to be saved, which I thought made the game feel much better. I see. Uchida-san, how did you come up with the sound for the bubbles? We wanted it to feel different when you're in a bubble, so we made a voice come from the Wii Remote. The first time I saw a bubble on the screen, it was drifting around as if it were saying "Lemme out!" so we had a voice say "Help me!" while a player is in a bubble. But later I learned you could also put yourself in a bubble. I thought having the Wii Remote say "Help me!" was a little strange for someone who wanted to stay in the bubble. Yeah, I can see that. Some people might not want out for fear of running into trouble. Right. But, like Mukao-san said earlier, you can shake the Wii Remote and get closer to the other players, so I wondered if we could have it say "Help me!" at times like that. So when you want someone to pop your bubble soon, you shake the Wii Remote up and down as fast as you can, and a voice in your hand says, "Help me!" The players' feeling and their action are completely in sync. I see. When you shake the Wii Remote and get close to your buddies, it sends the message that you want out, but if you don't shake the Wii Remote and you hold still, you mean, "Carry me along a bit." That's right. Your feeling and action match, giving it a more unified feeling. Uchida-san, when you want out, is "Help me!" the only thing the Wii Remote says? Video: "Help me!" "Hello!" and "Get me out of here!" I think that's the one that sounds like yakionigiri. It appears that some people hear the word "hexagon" when they enter a course. It's actually saying "Let's go!" Maybe it sounds different because Mario speaks English with an Italian accent. That must be it. Moving away from the bubbles, Ikkaku-san, could you tell us something you have heard people say about the game? This connects with what Asuke-san mentioned about people who are good at video games and people who aren't so good playing together. I heard it from a co-worker, though. This person has two sons in elementary school. The older one is really good at video games, but the younger one isn't. But the younger son couldn't keep up. That's right. The father and eldest son were moving on up, but the younger son was wandering around down below. That was a difficult stage, though, so the top two were having some difficulty. Then, suddenly - pow! - the screen changed to the goal screen. Even though they hadn't reached it yet? The younger son had found a hidden goal. Oh, I see! He found a hidden goal down below! Right. The younger son found it precisely because he was wandering around down below. Then the father and older brother told him what a great job he'd done. It's interesting about this game how when someone who is good plays together with someone who isn't, the good player doesn't always have to help out the other one. What did you have in mind when you designed the levels, Ikkaku-san? I mostly made them with a single player in mind. All of the courses can be cleared without dashing or wall jumping, but you can't get Star Coins without doing those things or making use of special items. However, when two or more people are playing, someone can turn into a bubble. One player can put the other on his shoulders and throw him, and the other player can turn into a bubble as soon as they get the Star Coin . If two people cooperate, they can easily get a Star Coin. Yes. I made it more difficult for a single player to get Star Coins. Did any of you get the feeling this time that Miyamoto-san was all afire because so many people had said that New Super Mario Bros.2 for the Nintendo DS was too easy? I got a strong sense that Shigeru Miyamoto was ablaze. 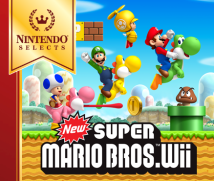 2 New Super Mario Bros.: An action game released for the Nintendo DS in May 2006 in Japan. I bet he told you to make this one more difficult. He did. (laughs) (Takashi) Tezuka-san3 was like that, too. When we listened to his opinions and reflected them in the game, the game required moves that hinged on insanely precise playing. It got to where we thought, "No, that's going too far." 3 Takashi Tezuka: Producer of New Super Mario Bros. Wii. He has worked on numerous games for Nintendo, including games in the Super Mario, Yoshi and Animal Crossing series. 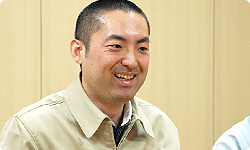 He is General Manager of the Software Development Department, Nintendo Entertainment Analysis and Development Division. It got more and more difficult. He's not very good at video games. But he'll tell you that himself! Nonetheless, he was saying he could handle it if it were more difficult. He even said, "If you make it that difficult, when people clear it, they'll feel a sense of accomplishment, which is much better." He was always saying, "Let's make it more difficult!" Tezuka-san was so focused on making it difficult that it fell to Toshihiko Nakago4 to apply the brakes. The whole time, Nakago-san had been saying, "Keep it easy." Tezuka-san would tell us to make something difficult, and we'd follow his orders, but then Nakago would come to us and say, "Why did you make that so difficult?" 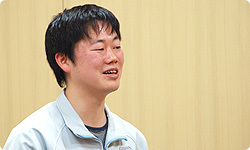 4 Toshihiko Nakago: Director in charge of mapping and level design for New Super Mario Bros. Wii. He has supported Nintendo's game development since the time of the original Nintendo Entertainment System for such titles as the Mario series and Zelda series. He is president of SRD Co., Ltd. But I think you achieved a good balance precisely because people from different perspectives were looking at it.